HAVANA, CUBA (03/AGO/2013.) 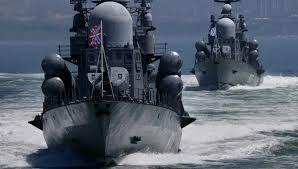 - Ships of the Russian Navy arrived on Saturday in Havana to meet a program of activities, stated the Ministry of the Revolutionary Armed Forces of Cuba (FAR). The naval vessels fired in salute 21 gun salute, while the FAR responded with an artillery battery from the Fortress of San Carlos de La Cabaña. During the visit, the head of the Russian ship and crew visited the Head of the Revolutionary Navy, the President of the Provincial Assembly of Popular Power in Havana and Granma Naval Academy. On Sunday, Cubans will have an opportunity to see the Cruise missile "Moskva", said in the statement of the FAR. Hundreds of Cubans and tourists watched from the coast the arrival of the Russian fleet, it is unknown how many days it will remain on the island. Cuba had a strategic alliance with the former Soviet Union for three decades, of which Russia was the largest republic until 1991, besides oil and credits Russia supplied the island with arms and trained their military officers. Most of Cuban armaments have Soviet origin and FAR has been seeking maintenance assistance and modernization in recent years. After the military parade in Moscow in May 2012, former President Fidel Castro praised the ability of Russia "to provide adequate and variable response b the most sophisticated conventional and nuclear means to imperialism”.